Fresh bread? 10-minute pesto using a bunch of basil from the garden? Let’s be totally honest, there’s zero chance that something like this ever lasts more than 24 hours here. The basil in the garden is really, really thriving. And so are the weeds. 12 days of rain out of the last 15 makes everything but the water in the pool happy. Just as the last big storm rolled in the other night, I ran out to the garden and ripped out one of the larger plants to whip up a quick batch of pesto. And I almost made it back inside before the bottom fell out of the sky. Almost. I used my favorite recipe for quick french bread and paired it with the last of the pesto. And following the folding technique I found here, I formed the bread into a twisted, braided wreath and then popped it into the oven. All while praying that the bread didn’t come out looking too much like lady parts. Because sometimes that happens. A note – I was out of parchment paper and should have formed the wreath on the cornmeal-dusted pan that I was baking with… but as you can see from the photos below, I didn’t. Moving it was a total pain and cost me $5 in the swear jar. So don’t do that. 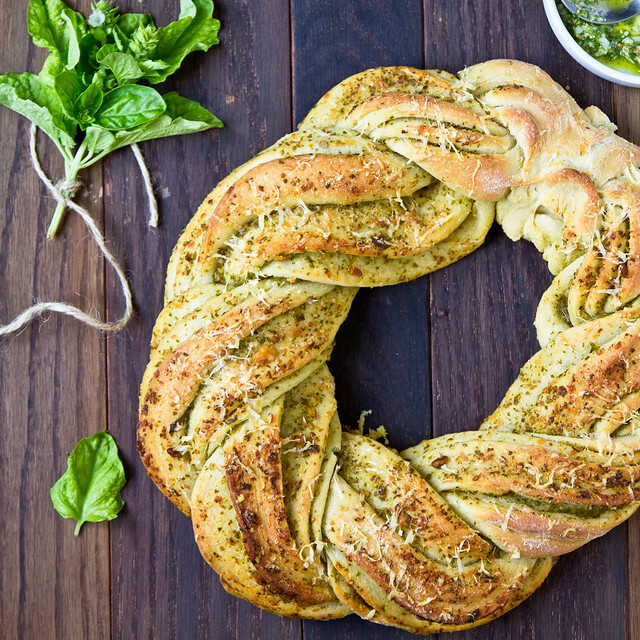 A beautiful, twisty wreath of bread made with fresh basil pesto from the garden. Form the dough into a smooth ball and transfer to a lightly greased bowl (I just use the mixer bowl) and let rise until doubled (~1 hour on the countertop, quicker in a slightly warmed oven). Roll into a rectangle ~18x12 inches. 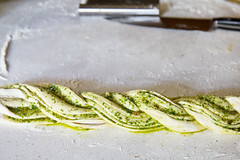 Spoon pesto over top, spreading evenly, leaving a clean 1/2-inch border around the edges. Transfer to your parchment-lined or cornmeal-dusted baking sheet. Working quickly, braid the two pieces, trying to keep the pieces twisted so the cut ends remain on top (this is what makes the bread pretty). Transfer to your baking sheet and let rest for 30 minutes. Top with shredded parmesan and bake for ~25 minutes, until golden brown. oh. my. heavens. I need this bread… like YESTERDAY!!!! Stunning. 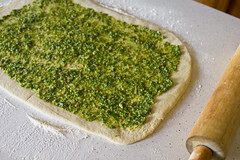 I love making fresh bread and pesto. This will be happening in my house stat. That looks incredible!!! I so wish I had a garden full of basil because I would be out there right now picking it. This will surely be made at some point this summer. Thank you for sharing the recipe! This looks ridiculously delicious and is ridiculously beautiful. And I almost died when I read, “All while praying that the bread didn’t come out looking too much like lady parts. Because sometimes that happens.” ALMOST DIED. This is absolutely beautiful!!! I bet it tastes even better than it looks, too! This is gorgeous! I need to make this soon! Taunting a carboholic with bread is evil but I totally love this. This looks awesome! And, pesto makes all carbs taste better! This would be such a great appetizer to bring to a party, and let everyone pick apart their own section of the bread. Definately keeping this recipe handy. I am hugely impressed by your work. The bread looks amazing. WOWWW… I would eat this entire loaf for dinner!! Gorgeous, and with all the flavors i love! Oh Shawnda, this is the most beautiful bread I think I’ve ever seen. Wow! Hahaha at the lady parts remark. Quite on the contrary actually – I think this bread turned out gorgeous! It’s almost too pretty to eat! I’m going to a bbq at my parents this weekend and I’m SO making this to bring! It’s gonna be such a hit. Why did you do this?! I’m staying away from carbs because we’re going to the beach in a month…guess that’s not gonna happen. I’m making this tomorrow!! I have never had much success with bread but this makes me want to try just once more. Fingers crossed!! Oh boy…this looks so yummy!! Holy yum, that looks good! This is stunning!!!! 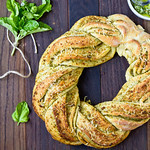 Love the idea of pesto bread, and that braiding is absolutely gorgeous!!! Oh my goodness! That would be gone in a second in this house. It is almost too pretty to eat… almost. You never cease to amaze me! I will be trying this out this week. I can’t get over how beautiful this is. No lady parts in sight! We’re having the opposite problem in Ohio. Hardly any rain at all makes for sad, shriveled basil plants. The weeds still seem to be thriving though. Darn those hardy things! I can’t get over how gorgeous this is. No lady parts in sight! And since I’m putting pesto on pretty much every slice of bread, pizza, or sandwich I make I might as well just bake it right in! 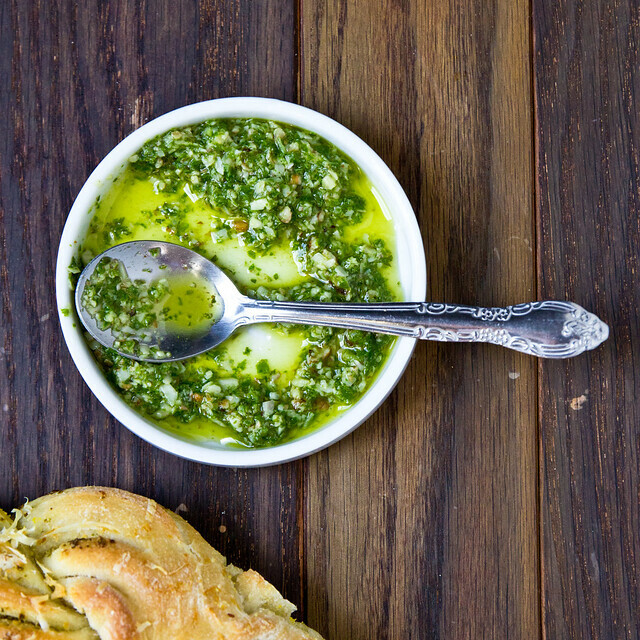 looks awesome and combines two of my favorite things – homemade bread and pesto. can’t wait to try!! Gorgeous, gorgeous bread! I have basil coming out of my ears; this will be a great way to put some pesto to good use! Also, LOL at “lady parts”! Ha! Are you using a dry yeast package or one of those blocks of yeast that are in the dairy section? I’ve never made bread before, but I have a ridiculous amount of basil coming in from the garden on a daily basis and have a TON of pesto already made and frozen and this bread looks AMAZING! I use Red Star from a jar, but it’s the same stuff in the package (only more cost-efficient). This. looks. dangerously. tasty. Nom nom nom. I can’t wait to try this ~ I am simply drooling! What a wonderfully beautiful bread – and so yummy too! Awesome photos. This is stunnung! I’m always looking for ways to use up pesto when my basil plants are in full swing. Holy Guacamole, does this look divine!!!! So divine, I’m headed to the grocery store to buy the stuff to make this…seriously. 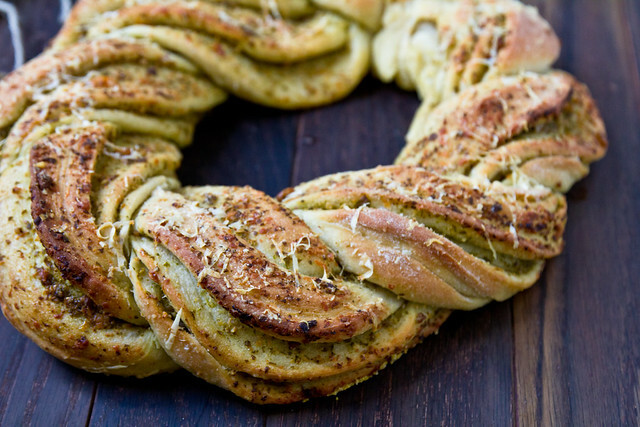 I LOVE pesto and I think this braided bread look beautiful! I laughed out loud not once, but TWICE while reading this entry. Let it be known, that never happens. My husband was sitting next to me and jumped every time a chuckle burst out. Also, this looks fabulous. Can’t wait to try it! I tried this Saturday and it although it looked nice, it was not even close to the beauty of your loaf. Guess it takes practice. Sure! Just make sure it gets the proper rising time. This is on its 2nd rise waiting to go into the oven right now. While I have basil coming out my ears, I had no olive oil or nuts to make pesto, however I did already have some store bought Sundried tomato pesto and Sundried tomatoes in my fridge. So I used the oil from the Sundried tomatoes for the olive oil in the bread itself and my Sundried tomato pesto for the filling. Then added some chopped basil from the garden and Parmesan to the filling before I rolled it up! I’m having it with lasagna, salad & pasta fagioli for an Italian Themed at home dinner date with the hubs tonight. Can’t wait to see how it turns out! Sounds like a fabulous twist! This sounds like perfection. And there are so many toppings I`d like to try – great recipe! I made this with store-bought pesto, and it was amazing! And such a show-stopper. My boyfriend and I devoured the whole loaf in two sittings. Well, one sitting if you count the fact that they were within an hour of each other. Whatever. I’m currently making a cinnamon sugar version, and I can’t wait to invent more fillings! Great recipe, thanks! 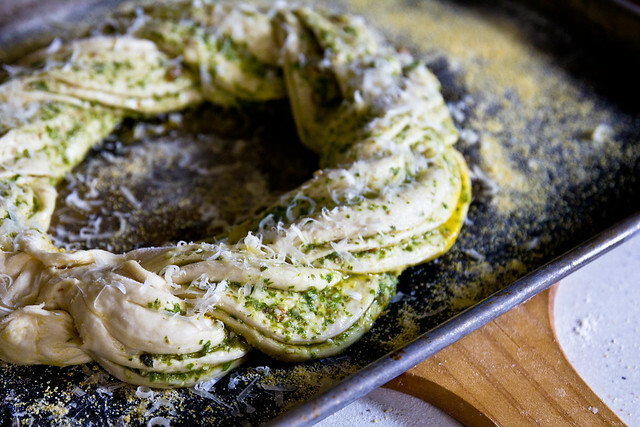 made this with your pesto recipe. I had a minor freak out moment when it seemed like my dough wasn’t rising. however, it turned out really well! crunch crust and airy/soft inside. Thanks for an awesome recipe! Heck, all of your recipes are good 🙂 Love your blog!! Thanks for the inspiration. Tried this out yesterday with homemade sun dried tomato pesto (and admittedly a refrigerated French loaf dough). I’m sure it doesn’t compare to the real thing, but I have to admit it still felt so special. Thanks for the post! I just tried it 2 days ago when I had friends over! We all loved it, it turned out great and it looks so impressive!! Obviously it was all over before dinner!! I can’t wait to try it again and perfect my braiding skills! Like many others before me… I will try different fillings!! Oooh I think I’m going to try this for Christmas! Maybe I’ll add sun dried tomatoes for more Christmas festivity. 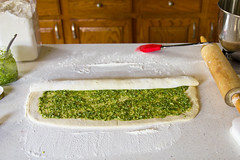 I’m also thinking of doing a sweet bread version with cranberries and pistachios? Oh the possibilities…. 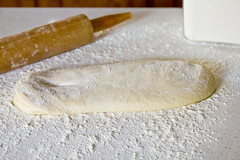 This is one THE best yeast dough recipes I have ever made! The result is beautiful to look at, impressive to present, and tastes crunchy on the outside with an airy light and fluffy inside. The flavour of fresh pesto is infused throughout. The only thing you want to do with the bread is keep eating it, which is not such a good thing. Love it! This is going to be a family favourite and the secret is: it is so easy to make. Do you think you could substitute the warm water for passata to recreate the classic tomato/ basil combo in bread form?? Not wholly – you need to proof the yeast with water. But it could be worth a try to replace some of the remainder of the water with the passata. How much does your “2½ cups of flour” weigh? I find that your recipe yields around a 75% hydration loaf which was way too wet for me to shape. I didn’t even bother cutting it in half to braid because it was very flat at that point. 11.25oz. I use the 4.5oz=1 cup measurement from… either King Arthur Flour or ATK. Made 3 loaves of your pesto braided bread as had glut of basil in the garden which made into pesto. The first loaf was devoured within hours of going in the oven so just made two more loaves to put int he freezer. Thank you for sharing this delicious recipe. Just made this, it was super easy and delicious! Only my third ever bread making attempt, and it wasn’t a complete disaster so woohoo! We have an abundance of kale from our CSA this year so I made a kale pesto to go with the bread. Not sure how it turned out yet as it’s baking right now to take to a graduation party. My husband came in the house and said he could smell it outside and that it smells delicious! Wow what a wonderful recipe! Does it still taste amazing if you leave it for 1-2 days or will it get dry? And what would be the best way to save it for the next day? I’ve just got a loaf of this on its second proove at the moment. I’m trying it with red pesto which made turn out to be too oily, but fingers crossed! No olives this time, but I chucked in some oregano and sumac on the basis that there’s little in life that isn’t improved with sumac.